Superintendent Eddie Johnson of the Chicago Police Department sadly reports the death of Commander Paul Bauer. Cmdr. 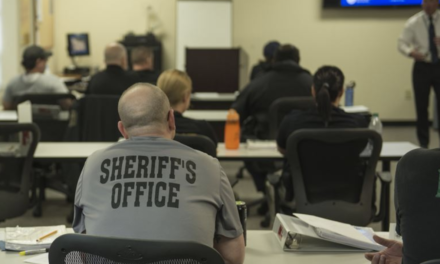 Bauer, 53, was attending a training seminar at the Thompson Center when he overheard radio traffic that the First District Tactical team was attempting to apprehend and individual that had fled from officers. The tactical team was working an area where there were numerous drug sales and shootings. Their intention was to interview him as he matched the description of a suspect in the shootings. Bauer, being a “hands on” law enforcement officer, located the suspect and confronted him in a stairwell of the Thompson Center. The suspect drew a firearm from his waistband and shot the commander several times. Other officers pursuing the suspect on foot apprehended him and recovered the firearm. Bauer was transported to the Northwest Memorial Hospital where he passed away a short time after his arrival. His body has been taken to the Cook County Medical Examiner’s Office for an autopsy. Commander Bauer was a 31-year veteran of the Chicago Police Department and was assigned to the 18th or “Near North” District. Eligible for retirement, he chose to stay on and work with community leaders and citizens to rebuild shattered trust in the police department and make the streets of Chicago safer. In a recent news interview he talked about his “Coffee with the Commander” program where he interacted with residents and business owners to rebuild that trust and revitalize the community. The last shooting death of a Chicago Police Officer was in 2011 and Cmdr. Bauer’s death is the thirteenth since 1998. 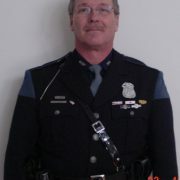 We can expect an Honors funeral for Commander Bauer in the next few days. Dress uniforms will be taken out of dry cleaner bags. Shoes will be shined. A family will rush to make sure their children are dressed properly for the funeral. On the day of the funeral, a police motorcade will accompany the funeral procession. Police squad cars from all over the country will line up and join in. Bagpipers will play Amazing Grace. Men and women in blue will shed tears while standing at attention. Then a few days later this will all fade into the shadows for most of our country. Only those who knew the commander will remember. After a few more days, the news will tell of another officer or two shot, possibly killed in another part of the country. 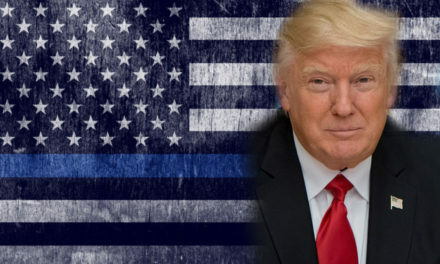 The crying will start fresh for that family and that family in blue. You don’t have these issues if you are a carpenter or accountant. Selling insurance won’t usually get you killed in the line of duty. These are good jobs for hard-working people, but it isn’t the same. Police officers are something special. Their spouses know it and they are just as special. Many others shared fond memories of Bauer. “He was the best police commander in the 18th District during the 20 years I lived there. He loved the job. He had a passion for the job. He was a good man. We lost one of the best today. It’s devastating. I don’t have words,” said Ald. Brian Hopkins, who rushed to Northwestern Memorial Hospital when he heard the news. During a somber moment in time, officers on foot and horseback saluted as a procession of dozens of police units departed the hospital to accompany the commander’s body on its way to the Cook County Medical Examiner’s Office. Bauer is survived by his wife and 13-year-old daughter. 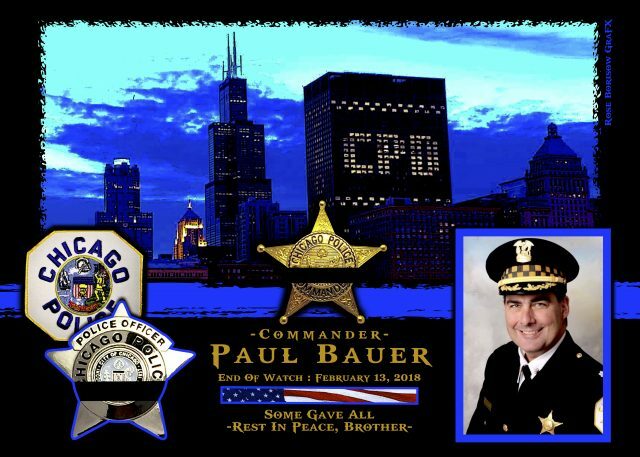 Commander Paul Bauer is gone, but will never be forgotten. EOW: Tuesday, February 13, 2018.